Summary: The 1byone O00QH-0506 wireless driveway alarm is made with low quality components and the PIR sensor is affected by passing clouds, sunlight and wind. I recommend the Guardline GL2000 or the Dakota 2500 as there are much better options for a driveway alarm. The 1byone model O00QH-0506 was designed to detect people, vehicles and animals. This is accomplished by a PIR (passive infrared) sensor that detects heat movement. The driveway alarm system is shipped with 1 receiver, 1 sensor, mounting hardware and instruction manual. The PIR sensor will send a signal to the receiver, whenever there is movement on the driveway. Once the signal in received, you will be notified by either a sound of your choosing, a flashing LED, or both. If possible, install the sensor in an area protected by sun, high winds or heavy rain. Also, do not mount the sensor on a metal surface, since this will affect the communication with the receiver. 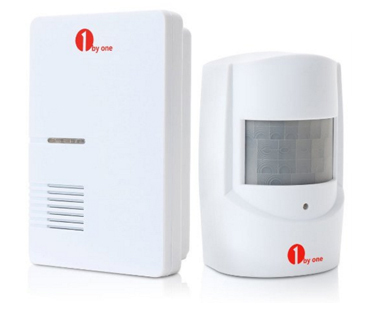 Even though the 1byone O00QH-0506 is also marketed as a driveway alarm, it’s more of an indoor security alarm. It’s extremely sensitive to sunshine, clouds and wind, so if it’s mounted outside, prepare for a lot of false alarm notifications. If you are looking for a good driveway alarm, consider the Guardline GL2000 (detects people and vehicles) and the Dakota 2500 (detects vehicles only).